Spotted this story yesterday on Valleywag – long story->short, guy working as an intern for a US branch of Anglo-Irish Bank, took a couple of day’s leave saying he had to head to New York home suddenly. I just wanted to let you know that I will not be able to come into work tomorrow. Something came up at home and I had to go to New York this morning for the next couple of days. 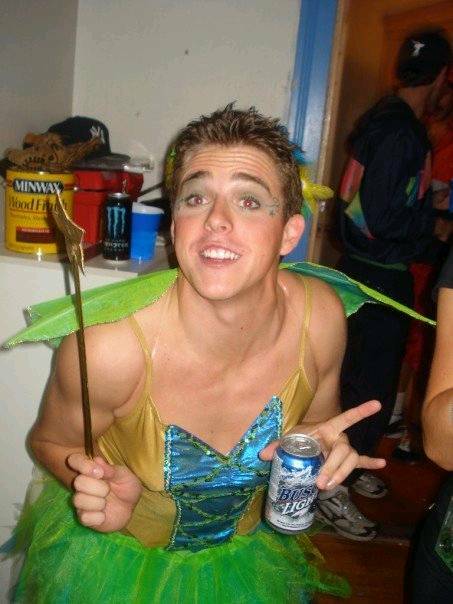 Then a photo of him is posted on Facebook dressed as a fairy (complete with wings and wand) at a Halloween party when he was supposed to be home in New York! and bcc’d the whole office! There goes his credibility, if not his internship! Valleywag are implying in their story that there is something new here. Facebook helps hip bosses keep track of employees! I can’t help but think that this story has happened over and over again. Employee does something silly. Gets caught. The only thing that changes is the names and the technologies. I’m sure there were similar stories doing the rounds with the advent of the phone and later the fax. There is nothing new here. It is a great photo though!